We learned a lot during our 4 month house hunting extravaganza, mostly that we never ever want to move again because it’s so stressful. Luckily, the finances themselves weren’t stressful because we tried to prepare as much as possible beforehand. 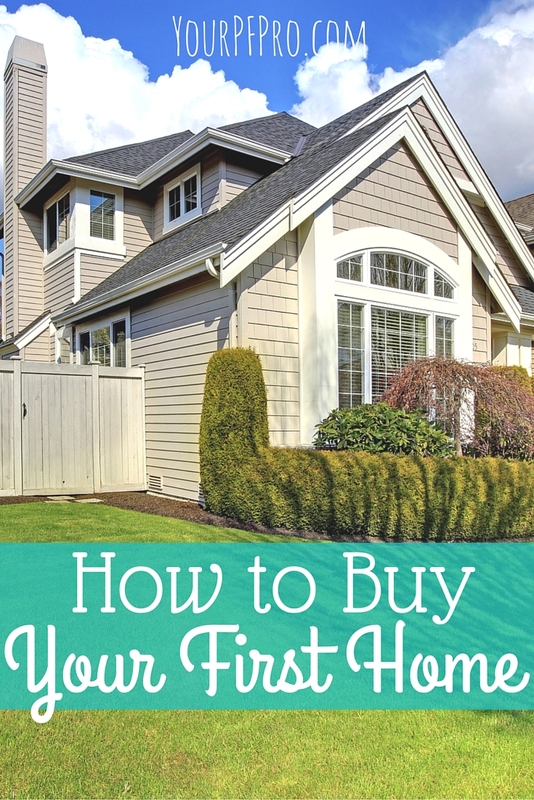 Here are the steps we took toward buying our first house together, and how you can buy your first house by following this outline. Really, you aren’t going anywhere if you don’t have decent credit. Regardless of why your credit is bad, people with “bad” credit (roughly determined at anything less than a score of 629) may be denied outright for a loan or may receive a higher interest rate. Can you afford an 8% interest rate if you have bad credit, or would you rather wait for a 4% interest rate and get your credit score up? You can find out your credit score at Annual Credit Report, which will give you your credit history from the top 3 credit reporting agencies, Experian, TransUnion, and Equifax. You can request this information once a year, and I would request it well in advance of doing anything else related to house hunting. You want to make sure your credit is solid before moving forward. After B and I ran our credit reports, we determined there were a few things we needed to clean up before buying a house. I had to dispute a claim made against me (it was a debt for someone else, not me), and we decided against closing out some credit cards just so we could show longevity on our credit. While it may seem counter-intuitive, you might not want to close out credit cards you’ve had for several years. I had one old credit card from when I was 18 and had wanted to close it for years, but it was showing positively on my credit score because it showed credit history for the last 10 years. If your old credit cards don’t charge an annual fee, considering keeping them until you’ve purchased and moved into your new house at least. Also, don’t sign up for new credit cards! If you want to churn credit cards, sign up well in advance of house hunting so it doesn’t negatively affect your credit report. Basically, the bank is trying to ensure you’re solvent and can reliably pay your mortgage. By looking at your bank statements, they’re trying to see if your lifestyle fluctuates wildly and may be a concern for paying your bills. If you’re planning to buy a house, plan as far ahead as you can. When you buy your first house, there are going to be so many random expenses, you can’t even imagine. Inspection report(s), bank fees, realtor commissions, etc. Start saving early! Luckily, this ties in really well with improving your credit, and not messing with your money. Cut living expenses and save everything extra you can for your down payment. You may even want to leave big trips and big purchases off the table in the year leading up to you purchasing a home, if you can help it. Nowadays, it can be really hard for the average Millennial to have 20% saved as down payment on their first house. Depending on where you live, a decent home can be $200,000, meaning you would need to save up $40,000 for a down payment. Don’t forget to add in all the other expenses associated with moving: you might need more like $50,000 just to ensure you have a cushion. Whether or not you can save 20% for the down payment on your first house, try to save as much as you can. If getting into a house is important to you, make it your number one goal over any other priorities. It’s not the end of the world if you don’t have 20% saved for a down payment, but you will pay private mortgage insurance (PMI), which is insurance for lenders in case you default. PMI eventually goes away once you’ve made enough mortgage payments, and it usually doesn’t add that much to your mortgage payment, but it’s great to avoid if you can. If you need help budgeting to purchase your first home, consider using Personal Capital as your budgeting tool. It’s a great way to see all your finances at once and keep track of where you are in the saving (and spending) process! What advice do you have for someone buying their first home?